Editor's note: This column was authored by Josh Hardman. It’s not everyday that your congressman threatens to nuke his constituents. But that’s what my congressman, Eric Swalwell, D-CA, did in a recent Twitter exchange where he said that any rebellion against gun confiscations “would be a short war...the government has nukes.” In other words, the might of the federal government could overwhelm a dispersed group of gun owners, with or without nuclear weapons, if push really came to shove. What’s more unnerving than Swalwell’s cartoonish word-choice, however, are the real gun confiscation measures he has proposed. 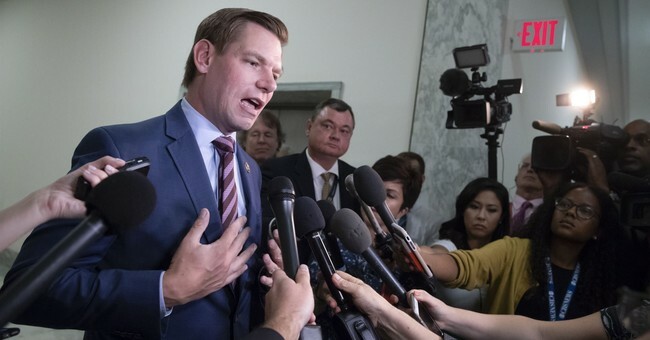 Swalwell introduced a bill which would, in addition to offering taxpayer money to “buy back” guns, task the federal government with prosecuting people who do not willingly participate in the program. His proposal is like a mafia boss’s offer to a small shopkeeper: accept my “protection” or feel my wrath. But this plan is foolish: No amount of gun confiscations from peaceful Americans can guarantee that fewer gun deaths will occur. As gun expert and Cato Institute scholar Matthew Larosiere pointed out in his thorough condemnation of Swalwell’s proposals, the attempted mass seizure of legally-owned “assault weapons” through coercive methods would constitute a new crisis of civil liberties violations. Congressman Swalwell alludes to roughly 15 million semi-automatic guns currently owned by Americans that he would like to confiscate. However, the progressive tendency to falsely conflate shooting statistics to stoke public fears and the ambiguity of the term “assault weapon” suggests that this figure—15 million—could easily grow with passing whims and popular sentiment to include more or all guns. Finding those guns would require enormous amounts of time, law enforcement resources, warrants, and informants. Our criminal justice system would be swamped with new, unethical and vindictive mandates. To achieve the ambitious ends of gun control fanatics, a new agency and surveillance apparatus may be needed. But that’s not even the biggest issue with this fantasy. The attempted prosecution of gun ownership is unethical and vindictive because it indiscriminately punishes millions of people that have nothing to do with any gun crimes. Thousands of peaceful people would have their rights stripped away, and many could be hurt or killed in the process. An encounter with a police officer can be a contentious affair, especially when people feel their property is being stolen or their home unexpectedly entered. For example, a Maryland man was fatally shot this month when police came to take his gun after a relative filed a “red flag” mental health complaint against him, his death occurring in the ensuing chaos of this attempted confiscation. If just owning a semi-automatic gun is criminalized, law enforcement will find themselves in far more sticky situations. That’s not good for officers themselves, or the people they police. To be sure, many Americans would calmly give up their guns. But if any argument in favor of gun confiscation doesn’t include the calculated risk of confiscation, they’re being disingenuous or naive. Even worse, if they bemoan their fellow Americans for not calmly giving up their guns, they’re demonstrating an authoritarian disdain for individual liberties. And while gun confiscations could lead to more deaths, greater distrust in police, and divided communities and families, it would be next to impossible to definitively say whether any lives would be actually saved by confiscation. Yes, gun control advocates can point to the people killed at a mass-shooting and say we have to do something. But this isn’t it. Out of all the ways to combat gun violence in America, from investing in mental health resources to shoring up enforcement of laws already in place, the attempted confiscation of guns is the most likely to send our society into turmoil. Imagine neighbors ratting each other out for previously legal possession of guns and then someone getting killed during a confiscation gone wrong. Think “The War on Drugs,” but the deadlier sequel. Congressman Swalwell really should know better. Still, maybe Swalwell will consider walking back his ideas. After all, the confiscation of millions of hidden guns is not logistically feasible with current resources, and even many Democrats will probably see his confiscation measures as a step too far. For the time being, we should hope his ideas do not gain greater popularity. But even if they don’t gain currency, it’s disturbing that Swalwell seems content with using force against peaceful citizens. I’m putting aside Swalwell’s exaggerated choice of nuclear weapons. He didn’t mean it seriously. But there’s no doubt his proposed solutions to gun violence would be like a bull in a china shop—and no nukes would be needed to cause some serious chaos. Joshua Hardman is a Young Voices contributor who lives in Fremont, California. You can follow him on Twitter @headwingnews.